It is over twelve years since Herr Hitler fixed on the site of his one and only home. It had to be close to the Austrian border, barely ten miles from Mozart's own medieval Salzburg. At first no more than a hunter's shack, "Haus Wachenfeld" has grown until it is to-day quite a handsome Bavarian chalet, 2,000 feet up on the Obersalsburg amid pinewoods and cherry orchards. Here, in the early days, Hitler's widowed sister, Frau Angela Raufal, kept house for him on a "peasant" scale. Then, as his famous book Mein Kampf ("My Struggle") became a best-seller of astonishing power (4,500,000 copies of it have been sold), Hitler began to think of replacing that humble shack by a house and garden of suitable scope. In this matter he has throughout been his own architect. There is nothing pretentious about the Führer's little estate. It is one that any merchant of Munich or Nuremberg might possess in these lovely hills. The entrance hall is filled with a curious display of cactus plants in majolica pots. Herr Hitler's study is fitted as a modern office, and leading out of this is a telephone exchange. 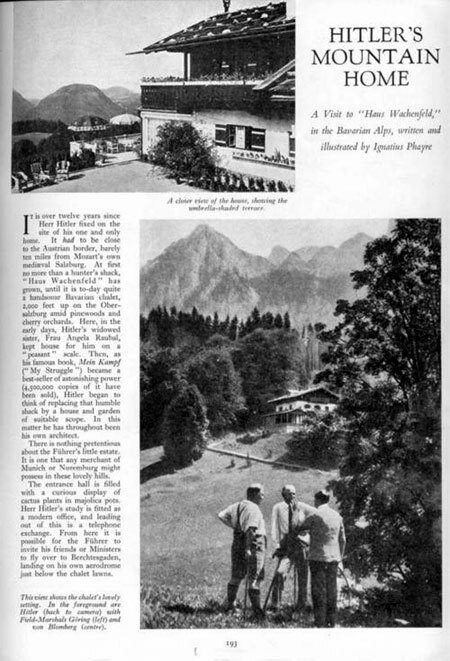 From here it is possible for the Führer to invite friends or Ministers to fly over to Berchtesgaden, landing on his own aerodrome just below the chalet lawns.